Today's The Kids Cook Monday post features a fun round of "what to do with the leftovers"! We had chili a few nights ago and I had some leftovers, but not quite enough for more than one person to eat. Now since chili does go good with cornbread, the idea of a chili-cornbread muffin popped into my head. F&B like making muffins. They're easy to make with kids and in many cases, Faith can make them completely on her own. These muffins were no exception. Since we already had leftover chili, we just used that as our base. I had about two cups that I warmed a little bit in the microwave and drained the excess liquid. We then mixed up a bowl of cornbread mix. I discovered a box of Jif hiding in the back of my pantry, so I took a shortcut, but if you want homemade cornbread, I recommend this recipe. Mix up the cornbread, then add the rest of the chili to the mixture. We also threw in the last little bit of shredded cheese I had, but that's optional. Scoop into muffin pans, lined with cupcake liners. The kids use an ice cream scoop for this, perfect amount of batter every time! Bake per the directions, or until the muffins are set. 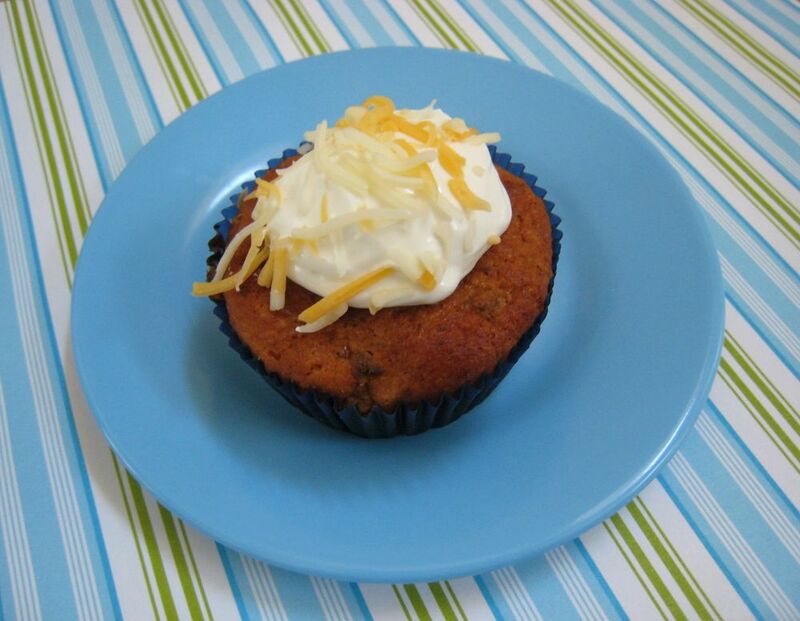 We served our muffins with a dollop of sour cream "icing" on top and some shredded cheese "sprinkles"! What a great idea! I cook chili a lot when it gets a bit cooler and I always have leftovers....love it! Perfect for the fall months ahead!! Fun idea! A perfect combo to make muffins out of, sounds so yummy right now!